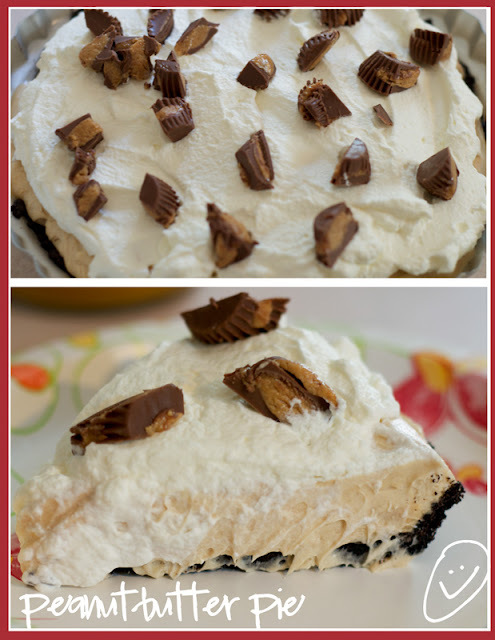 Lorrie's Story: The Best Ever Peanutbutter Pie!! I made a new recipe for one of my favorites.... PEANUTBUTTER Pie. OMG... it is so good!!! If you like Peanutbutter pie, I highly suggest you try this recipe. It's one from Pinterest/Willowbird baking. You should click on the link and read the story behind the peanutbutter pie, very touching. I also highly suggest you try out Pinterest if you haven't. It's everything you can think of from Recipes, to funny signs, to crafts and cards, fashion, homes. You name it, it's on pinterest. Sorry, back to the recipe. Here ya go, guys! Preheat oven to 375 degrees F. Combine the cookie crumbs and melted butter with a fork and press into a 9-inch pie plate. Spend a few minutes working on it to make sure there aren’t gaps and that it’s a thin layer (I had to discard some of my cookie crumbs because 1 1/4 cups turned out to be a bit too much for my pie plate). Bake for 10 minutes. Cool completely. In a large mixing bowl, beat the cream cheese, peanut butter, sugar, butter, and vanilla until smooth. Whip the cream to soft peaks. Stir 1/3 of the cream into the peanut butter mixture to lighten it up, then gently fold the rest of it in. Gently spoon the filling into your crust and use an offset spatula or the back of a spoon to smooth it out. Chill this for a few hours. To make whipped cream, whip cream and confectioners’ sugar together until you reach soft peaks. Spoon this over your peanut butter pie and top with peanuts and mini peanut butter cups for garnish, if desired. Serve immediately.